There are many things to love about Dallas: The Dallas Cowboys, the amazing art district and sculpture center, endless restaurant options, interesting museums, and a lively country music scene. But with all these activities, tourist attractions, and the need for housing for a growing population, Dallas is also an incredible source for job opportunities. In particular, employment in the construction, repair, maintenance, and renovation fields are in continuous demand. This is good news for anyone who is trained to operate similar equipment. Not just anyone can hop on a heavy forklift and call themselves an operator. The tasks and techniques can be tricky and in order to avoid injury, workers need to be certified. How Can Dallas Forklift Certification Help Me Find a Great Job? 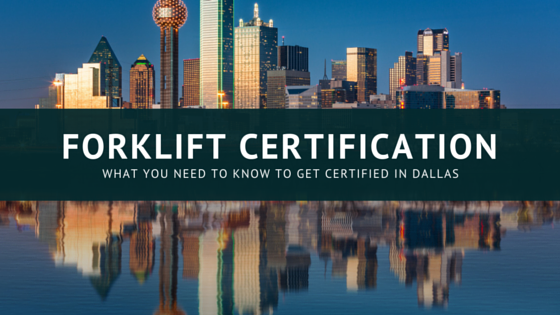 Forklift certification is necessary for many construction jobs in Dallas because it is the most important education an operator can receive. It prepares workers to assess a forklift and the surrounding area for any safety hazards, and it teaches the methods of operating a forklift safely and efficiently. This training ensures workers are competent, and aware of the dangers involved in driving a forklift so they can make smart decisions. Forklift certification also protects employers from being hit with hefty fines from OSHA, who crack down on uncertified working environments. There are so many industries you can become a part of with a forklift certification. If you love museums, you can apply to be a technician and forklift operator to help assemble/disassemble art installations. If you are a beer connoisseur, you may find opportunities for warehouse workers with a large brewing company. The possibilities are endless, and you have the chance to customize your career to your interests. How Do I Complete Dallas Forklift Certification to Accomplish My Career Goals? The great news about this important education is that it doesn’t have to come with an expensive price tag, or hours sitting inside an offsite training facility. With CertifyMe.net, students can complete their training online wherever they have an internet connection. All you have to do is create an account on the CertifyMe.net website, work through the online modules, and in only one hour, be ready to operate forklifts. It’s that easy. And it only costs $59.95. Depending on your current or desired forklift position, you have the option of choosing equipment-specific training. Warehouse forklifts, pallet jacks and order pickers, and rough terrain forklifts are all included in our package options. While sitting on your couch at home, or during a lunch hour at work, you can complete the Dallas forklift training you need to qualify for better-paying jobs. And at the same time, improving your quality of life in Dallas. Take a few moments to create an account, and print your certification in one hour. Sign up today!